Karen Margolis and Jill Moser. Transcending formulaic categories, the four contemporary female artists in Define Line blur the conventional boundaries between mediums through their heightened and sophisticated use of line on a two dimensional surface. Utilizing a fluid interpretation of space that is considerably more sculptural, while further defined and contoured by abstract line, Susan Daboll, Sharon Louden, Karen Margolis, and Jill Moser expand the meaning of the linear mark and gesture as it loops and twines in their drawings and photography. Descending from and extending the powerful legacy of Eva Hesse, this exhibition considers the various spatial and sculptural properties of an abstracted line. These four artists follow in the tradition of Hesse, who worked in many different mediums from drawing to painting and sculpture, while managing to obscure and play with these supposedly rigid classifications to create a totally unique body of work. In her recent work of the past ten years, photographer Susan Daboll has consistently expressed an interest and affinity for the building blocks of abstract painting, mainly those of saturated, flat color, line, composition and form. In addition to smudging the line between painting and photography by obscuring and abstracting her subject matter, she uses the camera as a tool to reshape her view of the natural world and all its playful expression. In Branches I, Daboll presents a series in nine parts of tangled brambles set against a hazy, nebulous sky. The photographed line retains a strict twisting velocity as it carves out a space within the confines of the cropped image. The delicate and minimal drawings of Sharon Louden are also very much concerned with space and the four binding edges of the paper. She gently injects a personality into her supple lines while enhancing the tension inherent in applying a mark onto a very empty, blank expanse of paper or transparent acetate. Employing different sized papers along with various inks and paints, Louden's intricately composed clusters of line are directly related to our perception of objects in three dimensional space as well as her own sculptural practice. In restricting herself to the edge or corner with her repetitive marks, she ends up somehow sculpting the empty expanse of paper and making it a partner and counterpoint to her lively and sometimes sexual markings. Basing her work on both the microscopic and macroscopic world of science, biology, physics and cosmology, Karen Margolis directly relates her line drawings on paper to her sculpture, while sometimes interweaving the two in the same artwork. Margolis employs line in various all-over compositions that trace out worlds and spatial dimensions unseen to our own eyes. Even though defined by paper edges, her line renderings become expansive and far reaching, as they seem to form an intuitive underlying, unbreakable structure that connects all things. 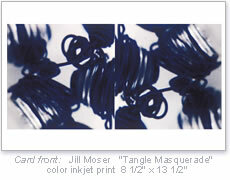 The photography and drawings of Jill Moser share a common heritage. Each was created from the impulse to somehow define the space of a surface using only a tightly coiled, concentric line that both implies volume, shape, and movement while resisting any one absolute meaning or representation. Her photographs, which grew out of her paintings and drawings, are actually images of little sculptures of wire wrapped around light bulbs and housed in her studio. Her tracery of lines, whether from brush or lens tends to loop endlessly around itself. It is a commanding line in its trajectory, only to allow around the next curve, elements of humor, sexuality, and the human body into the space of the abstract image.